High-impact resources to help you grow relationships with clients and prospects. During the next several decades, we can expect roughly $25 trillion in wealth to be handed down by the elder parents of the boomer generation, $7.2 trillion of which will go directly to boomers. This constitutes the largest inter-generational wealth transfer in history. Most of today’s financial professionals aren’t equipped to assist families in creating effective and comprehensive “legacy” plans that best address the needs of all members of client families. 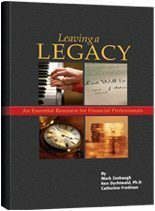 “Leaving a Legacy: The Essential Resource for Financial Professionals” is a special report guide based on Age Wave’s groundbreaking, comprehensive national study of the attitudes, hopes, worries, priorities, plans, and goals of both the elder generation and their heirs—the 77-million-strong baby boom generation. Financial services professionals have an unprecedented opportunity to become an ideal legacy advisor if they can help families pass their legacies on from generation to generation. There are many books today that guide financial professionals on the nuts and bolts of preparing estate plans, yet, until this book, there were none that provided actionable ways to address the thorny and difficult subject of inheritance, legacy, and wealth management with multiple generations of clients. Published by Age Wave Press and coauthored by Ken Dychtwald, Mark Zesbaugh, and Catherine Fredman, this indispensable report covers the key issues, challenges, needs, and motivations of both boomer and elder clients and delves into the four aspects of legacy management and transfer, which include 1) financial assets, 2) meaningful possessions, 3) wishes/directions, and 4) values/ethics/history. In addition, each chapter is complete with valuable tools, resources, and suggestions. More than anything, this is a field guide that will help financial professionals become effective legacy advisors and learn how to engage clients and their families in meaningful conversations.